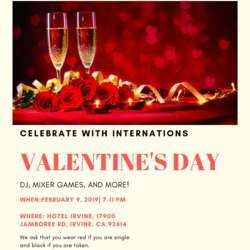 Celebrate Valentine's Day with your InterNations friends! Adults of all ages welcome. Dress to impress. Cocktail attire. We ask that you wear RED if you are single and BLACK if you are taken. We recommend that you carpool or ride Uber/Lyft.